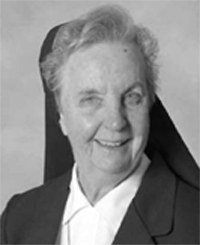 Sister Mary Kelly, I.H.M., formerly Sister Maria Veritas, I.H.M., died Jan. 19 in Camilla Hall, Immaculata, in the 66th year of her religious life. She was 84 years old. Born in Strafford,ChesterCounty, Sister Mary entered the Congregation of the Sisters, Servants of the Immaculate Heart of Mary in 1946 from St. Katharine of Siena Parish, Wayne, and professed her first vows in 1949. She received her Bachelor of Arts degree fromImmaculataUniversityand a Master of Arts fromFordhamUniversityinNew York. Sister Mary taught in the elementary and secondary schools of the Archdiocese of Philadelphia and in the Dioceses of Harrisburg andMetuchen,N.J.While serving in the Diocese of Harrisburg, she was elected the first president of the newly formed Sisters Advisory Council. From 1981 until 2000 she was the principal ofVillaMariaAcademyHigh School, Malvern. In 2000 Sister Mary was assigned to Camilla Hall where she served in the business office. The funeral Mass was celebrated Jan. 23 at Camilla Hall. Very Rev. Andrew D. Ciferni, O. Praem., was the celebrant and homilist. Father Bernard M. Tracey, C.M., and Father William Dean were concelebrants. Interment followed in theImmaculataCemetery. In addition to the members of her religious community, Sister Mary is survived by her sisters, Sister Joan Dolores, I.H.M., and Sister Margaret John Kelly, D.C.; a brother-in-law, William Conway; and nieces, nephews, grandnieces and grandnephews. She was predeceased by her parents, John and Margaret Walsh Kelly; seven brothers, John, Joseph, James, Thomas, Edward, Charles and Aloysius, and a sister, Marguerite Conway.